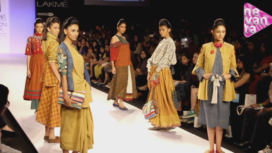 Sailex offers an interesting line-up to beat the heat at the Lakme Fashion Week. Extensive use of shibori is a translation of his theme of subtle transition of the undercurrents of the inner tectonic shifts appearing as light ripples on the surface. Pencil skirts, pea coats, capes, maxis, jumpsuits and dungarees highlight his evening wear collection. 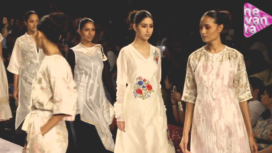 His play with hooks and snap buttons to embellish his silhouettes earns him brownie points. Take a look.